The German company Foto Quelle sold many cameras under their own brand Revue. The AC5 is a Chinon CP-7m. A fully packed mid-eighties SLR for 35mm film, micro-processor controlled programmed functions, hence the name "digital", which of course at that time had nothing to do with digital photography. 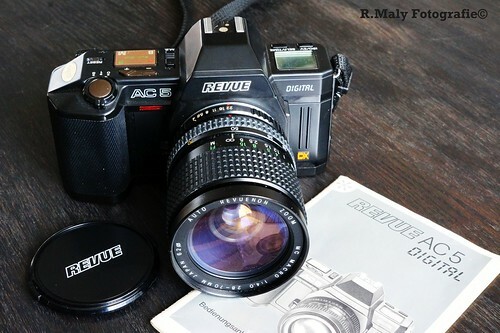 Revue also provided a large catalog with lenses and accessories, shown here with Revuenon 28-70mm f/4 macro lens. Besides the normal manual, program and aperture priority mode, this camera features "Action" and "Creative" modes. Action puts the emphasis on fast shutter speeds, it selects aperture and speed automatically for best results. The Creative mode is made for taking pictures with as much blurred background as possible, the camera will select an aperture as wide open as the light conditions allow it to be in combination with shutterspeed. electronically controlled stepless shutter between 15sec. and 1/2000sec. This page was last edited on 6 January 2016, at 20:29.